Editor’s Note: “Cart Talk” is our new, weekly discussion about shopping carts with the merchants that use them. For this inaugural installment, we visit with a merchant that sells both digital and physical products via Limited Presssing, a hosted shopping cart. There are now almost 600 online shopping carts for merchants to choose from. 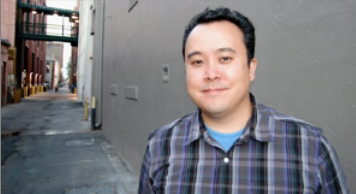 This includes hosted carts, licensed carts and open-sourced carts. Each week we will be interviewing a merchant that uses a particular cart, to get frank, real-world feedback on its use – what works and what doesn’t work. This week, we’ll hear from Virgil Dickerson, CEO and founder of Suburban Home Records and Vinyl Collective, a Denver, Colo.-based music label that sells digital downloads, clothing and physical albums (CD or vinyl). Dickerson’s company uses Limited Pressing, a hosted shopping cart and social community for musicians and music labels. According to its website, Limited Pressing’s prices range from free to $14.99 per month. The company is based on Long Island, New York. Dickerson uses the Limited Pressing cart to sell approximately 50,000 albums per year online, both digital and physical. 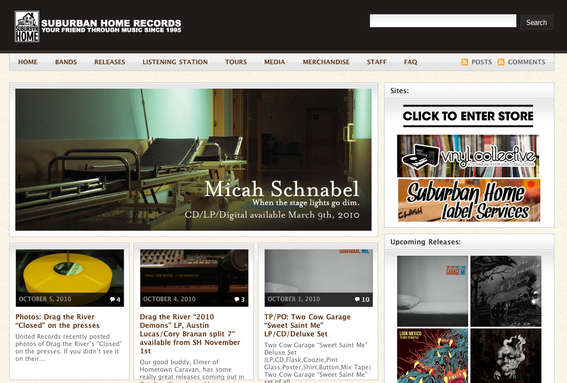 Suburban Home Records, home page. Practical eCommerce: Why Limited Pressing? Virgil Dickerson: “After having used ChannelAdvisor and Zen Cart, I have found the best option for my business with Limited Pressing. The guys who run the company are very hands on and are easily accessible if a problem should exist. The cost to have a store with Limited Pressing is very inexpensive. But even though the price is low, the store is of a very high quality – it gives me everything I need. PeC: How much does your company pay for the cart? PeC: When did your online store launch? PeC: How long has your company been using Limited Pressing and did you try others? PeC: Can you describe how you process orders in Limited Pressing, step-by-step? Log into my Limited Pressing store dashboard. Click the ‘orders’ button in the store dashboard. Print the orders for that day. Copy and paste name, address and email address into Stamps.com where I then print the postage for each particular order. Return to the Limited Pressing store dashboard and select ‘update shipping’ for each order processed, so the customer is notified via email of the order being shipped. The customer places an order for a digital product. The customer receives an instant ‘checkout complete’ email, which contains a link to download the digital product. The customer can download the product from that email link for up to two years. Dickerson: “I would like to see built into the store the ability to upload product info by spreadsheet, Excel or otherwise. “And with this same concept in mind, I’d love to be able to make changes to my entire catalog by uploading an ‘update spreadsheet’ in the event that I need to change pricing, etc. to a number of my titles all in one fell swoop. Dickerson: “Limited Pressing is perfect for my needs and I’ve tried so many options and learned from experience what works and what doesn’t work. “If you’re just starting out, I think it is very important to look into as many cart options as you can after making a list of what you would like from a store/shopping cart. If you don’t happen to have a lot of experience with various carts, research them as a consumer – do a fair share of shopping online, so you can take away your likes and your dislikes with the stores you shop at.